The first professional steel wheel with 1-in. 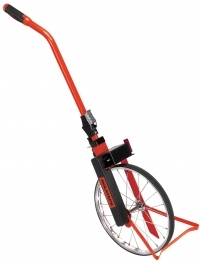 accuracy, the 32-401 Professional Measuring Wheel offers years of reliable use. Professionals will rely on the durable design and accuracy to perform on pavement, dirt and rough surfaces. Ideal for road construction, landscaping, janitorial, general construction, appraisals, accident reconstruction and crime scenes.